Once the dust settles and we're finally able to look at 2016 in our rear view mirrors, we'll hopefully view this doozy of a year for at least being a good one when it came to films. 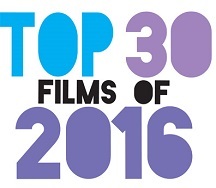 This year's top 30 movies list -- as voted on by Under the Radar's film staff -- features indies and blockbusters of many genres, from dramas to comedies to science fiction to horror; foreign language films, documentaries, and even an animated kids' movie. Not only were great films being made and released, but great films of many varieties. It's a promising sign for 2017, and one reason to hold out hope in the months to come. If you're looking for a way to get through these dreary winter months, you could do far worse than catch up on the fantastic flicks below. La La Land was very nice! I really loved it! Moonlight was something special i agree!